*This post is sponsored by Learning Resources. I received a free product to facilitate my post. All opinions are my own. I am a HUGE advocate of toys that inspire learning and creativity. When a child can use their hands AND mind while having fun with a toy, you know you have a winner on your hands. Children who enjoy other popular building toys and sets will LOVE the M•Gears® toys from Learning Resources. These building sets require a child to employ critical thinking while deepening their spatial awareness skills. As the galactic vehicle begins to take shape, kids will begin to use their imagination – developing stories and adventures as they play. From the deepest regions of the galaxy comes the M•Gears® Space Squad. When an alien menace threatens their home planet of Gearon, a group of heroes join forces to save the day! Triumph is the leader. Strong, brave, and ready for action, Triumph is specially equipped to help those in need. Also available are Krunch (LER 9437-D) and Rover (LER9436-D). These galactic heroes always work together to solve any problem, defeat any foe, and triumph over any challenge! When trouble is near, the Space Squad is here! This trio of galactic vehicles provide hours of entertainment through construction and imaginative play. Perfect for developing critical thinking, problem solving, and fine motor skills, M•Gears pieces are compatible with other, popular building sets. Each M•Gears vehicle features a pull-back motor, offers extra replacement parts, and comes in a handy, re-sealable storage container. Best of all, all three vehicles (Triumph, Krunch, and Rover) can be combined to create a fourth, larger model. These sets are sure to be a welcome addition to the collection of any avid or novice builder. These are durable, high-quality, and jam-packed with learning opportunities! 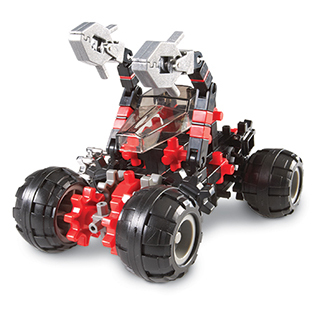 Beginners may appreciate adult assistance with this 78-piece set, while advanced builders may create their own unique inventions. My kids are going to LOVE putting this together, and I am eager to watch their imaginations come to life as they develop their hand-eye coordination, logic, and critical thinking skills.